When you get Nest Cam, you get a camera that needs to be plugged to an electrical outlet using the provided adaptor. The cam connects directly to your Wi-Fi network, and will send the captured videos to the cloud where they will be stored under your account. Using your smartphone, tablet or computer, you will be able to view both live and recorded videos (for recorded videos a subscription to Nest Aware is required). With Arlo Pro, you get a camera and a base station. The camera contains a battery and does not need to be plugged to an electrical outlet. It communicates with the base station which is connected to your Wi-Fi network. The base station collects the videos captured by the camera and transmits them through your router and Internet service to your cloud storage account. The advantage here is that you can place the camera anywhere, as long as it is not more than 300 ft. away from the base station; no electrical outlet is required for the camera itself. Note that the base station is hardwired to your router and needs to be plugged using the provided adaptor. With Ring Stick Up Cam, you get a camera that gives you the option of using it both indoors and outdoors. ​It can be installed on any flat surface, wall or ceiling. The cam connects directly to your Wi-Fi network, and will send the captured videos to the cloud where they will be stored under your account. Using your smartphone, tablet or computer, you will be able to view both live and recorded videos (for recorded videos a subscription is required). This article will compare in more detail the NEST CAM, ARLO PRO and RING STICK UP outdoor security cameras/systems. These were not just the most popular among Amazon customers at the time this article was written, but they had also received excellent reviews from most Amazon buyers (an average rating of at least 4 stars out of 5 stars each!). All three cameras support Wi-Fi and allow watching live or recorded video using your smartphone, tablet or laptop. With Nest Cam, if you have the Nest Aware subscription, you will get continuous 24/7 recording of live video for either 10 or 30 days depending on your subscription. You can watch the recordings from your phone, tablet or computer using the Nest App. The subscription allows you also to create, save and share clips form your recorded video. A free one-month Nest Aware subscription trial period is offered. With Arlo Pro, free cloud storage of videos is provided for the life of the Arlo Pro cameras. Note that the recording is not 24/7 continuous, but takes place only when the camera detects motion or sound. Note that using the Arlo Pro App, you can set the amount of time of the recording when sound or motion is detected. With the free Basic service, you get a rolling 7 days of recordings that are stored in the cloud. To get cloud storage for the last 14 days or 30 days, you will need to subscribe to their Premier or Elite services. You can access these recordings from anywhere you are, using a mobile device, or on a Windows or Mac computer. 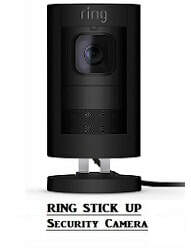 Ring Stick Up Cam will record to the cloud when motion is detected. It also records when you live stream video; it will record whatever you are streaming. For $3 per month, you can access your videos anytime and anywhere, save all your videos for up to six month and share videos with friends, family and neighbors. Nest Cam and Arlo Pro cameras allow modification of the resolution. With Nest Outdoor Cam, you can switch to 360p, 720p, 1080p or auto. With Arlo Pro, the default video resolution is 720P, but you can change this setting to a higher or lower resolution. With Ring Stick Up Cam, the resolution is 1080p and can not be modified. All three cameras feature two-way voice communication. That is a great feature: not only you can talk to the people coming to your home before you let them in, but you can also scare them away by talking or shouting, if you don't recognize the person, or if the person looks suspicious. Both Nest Cam and Arlo Pro can push notifications to your smartphone, send you e-mail alerts, or do both. To receive notifications on your mobile device, you must get the camera's associated App. Ring Stick Up Cam alerts you with a cell phone notification that can be with sound or silent with just a pop up notification. If you buy a ring "chime" and link it to your camera via the Ring App, you can configure the chime to ring each time there's motion (see Amazon products section below for the optional chime, if interested in the chime feature). All three cameras allow configuring the alerts so that they are sent during specific time periods. The Apps can be configured around a schedule, per day, in which you specify when it's on and off. With Nest Cam and Arlo Pro, you can also select whether you want e-mails or phone push-notification or both to be sent. 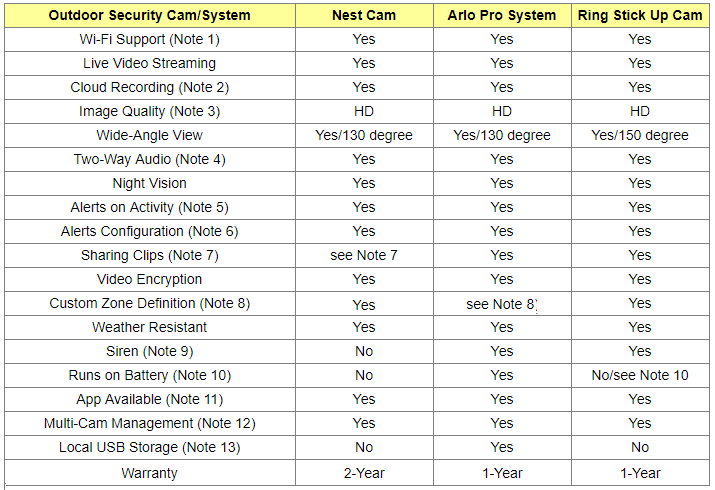 Note that, because Arlo Pro comes with a base station which is like a computer in itself, it allows more detailed provisioning than can be done with the Nest Cam, in particular for setting up modes and rules used to activate the cameras, for managing multi-cameras, and for sending alerts. With Nest Cam, you will need to subscribe to Nest Aware for creating and sharing clips. Note that Nest Aware comes with a one month free trial period. With Arlo Pro, the Basic service allows creating clips and snapshots from live video that are stored in the Arlo cloud. These can also be downloaded and shared. With Ring Stick Up Cam, you will need to subscribe to a Ring Video recording Plan to access your videos anytime and anywhere, save all your videos for up to six month and share videos with friends, family and neighbors. With Nest Cam you can assign multiple zones: you can select areas, name them, and choose how you're alerted to activity in those areas. Ring Stick Up Cam allows you to create and customize up to three motion zones to protect the most important areas of your home. With Arlo Pro, you can set the sensitivity, but you can not at this time define isolated motion zones. The Arlo Pro base station includes a siren. You can manually activate or turn off the siren. You can also set up motion detection rules to trigger the siren and select the siren volume level when you set up the rule. The siren has three volume level settings: Loud, Very Loud, and Extremely Loud. Ring Stick Up Cam also supports a siren that can be remotely activeated. Arlo Pro Cam does not need to be plugged. Because it contains a battery, it can be placed wherever you wish, as long as it's not more than 300 ft. away from the base station. No electric outlet is required. The cam communicates with the base station which will be inside your home and needs to be plugged using the provided adapter. Nest Cam needs to be plugged to an electric outlet. Ring Stick Up Cam can not be used with a battery and needs to be plugged. Apps are available for all three cameras so that you can watch live and recorded videos from your smartphone, tablet or computer. To view video from your computer, logging into the camera's website is required. The procedures and website addresses are detailed in the product guides. The Apps are also used to provision various camera related parameters and camera activity related conditions. Note that because Arlo Pro comes with a base station which is like a computer in itself, it allows a lot more detailed provisioning than can be done with the other two cameras, in particular for setting up modes and rules used to activate the cameras, and for managing multi-cameras. All three cameras allow multi camera management. But as mentioned, because Arlo Pro comes with a base station which is like a computer in itself, it allows more detailed provisioning than can be done with the other two cameras, in particular for setting up modes and rules used to activate the cameras, for managing multi-cameras, and for sending alerts. All recordings are stored in the cloud, but you can optionally connect a USB storage device to the Arlo Pro base station and use the USB storage device as a backup location to store recordings. Simply connect a USB storage device and the base station automatically enables all the settings for you. The USB storage device cannot be used on its own as a substitute for cloud recording. If you connect a USB storage device, the camera records to both the cloud and the USB storage device for motion-triggered and audio-triggered recordings. If the camera and base station are powered on, but the Internet goes down, the camera continues to record to the USB storage device. The Arlo App notifies you if the USB storage device is full. So which outdoor security camera is best for your needs? All three outdoor cams considered here are excellent products as shown by the average rating each had received from Amazon customers at the time this article was written. As mentioned, all three had received at least 4 stars (out of 5 stars). There is a good chance that you would be quite happy with anyone of these outdoor cams. However, there are some important differences that you might want to consider before making up your mind. The place where you need to place your camera is equipped with an electrical outlet. ​You don't want to worry about recharging batteries. You prefer continuous 24/7 live video even when there is no motion or sound. You don't mind a subscription fee for viewing recorded videos as well as creating and sharing clips . You prefer a 2-Year limited warranty. You need to place your camera outdoors somewhere with no electrical outlet. You want to be able to have free access to the recorded videos, generate and share clips/snapshots. You'd like your security system to have a siren to scare the intruders off (note that the siren activation and siren volume level can both be configured). You want to be able to download your videos to a local USB device that can be connected to the base station. It can be installed on any flat surface, wall or ceiling. Has a siren to scare the intruders off. Allows you to create and customize up to three motion zones to protect the most important areas of your home. Allows integration with the Ring Doorbell and Ring Chime for complete home security.